Plastics are contemporary, synthetic materials. Plastics are oil and gas based, and consumes less than four per cent of our oil and gas reserves. Plastic in fact saves the energy it takes less energy to convert into plastic from raw materials. Throughout their whole life circle one-third less energy needs than making paper bags. Without plastic, whole packaging would take almost double energy by around 160 percent. The better-quality properties of plastics such as sanitized or germ free barrier properties, light weight, and durability contribute appreciably to our health and quality to way of life. The Plastic industry has been witnessing a continuous increase in demand from a long time attracting many towards it. To all those who are looking forward for a proper understanding of technology and methodology used in the plastic industries so that they could penetrate into plastics industries with a consideration of the current industry trend then this book provides you about certain very essential information about Plastic. PVC can be processed by all the conventional conversion processes as used for other thermoplastics but with some modifications. This book covers an intensive study of Current Trends in Conducting Polymers with a significant and detail explanation of thermosetting, thermoplastic material and products environment health and the future prospects. plastics Using Co-Rotating Twin Screw Extruders, Economical Film Extrusions with Modular Systems these are few chapters that are very informational and will help you in deep penetration of the industry. Along with these feature the book also encloses a directory section which list all major manufacturers of plastic processing machinery and raw material suppliers. PVC can be processed by all the conventional conversion processes as used for other thermoplastics but with some modifications. PVC Resins in unmodified form are virtually unprocessable and therefore, have to be modified by incorporating. Additives modifiction is also required to enhance polymer properties and to ensure the service life of the end-product. Some additives are used to enhance polymer processability. Other additivies are used to enhance mechanical and electrical properties. Some stabilizers like dibasic lead phosphite provide a unique balance of properties such as excellent heat stability improved electrical insulation and outstanding weather resistance. 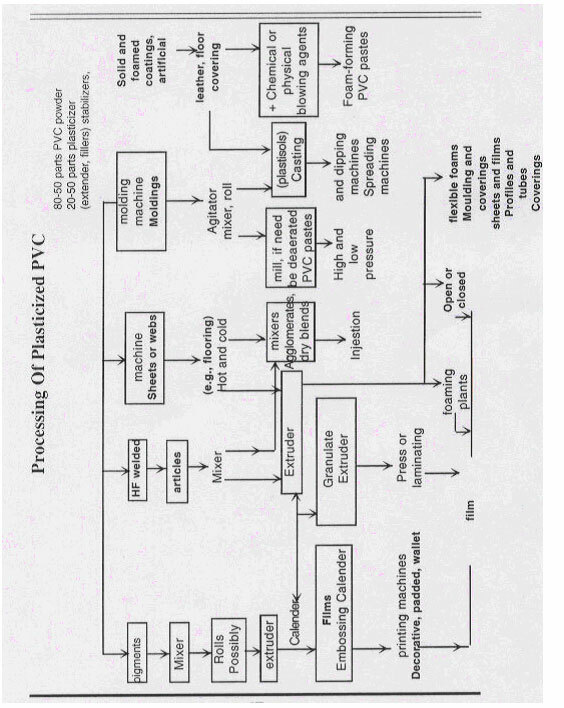 Achieving a balance of these additives to obtain the desirable processability and heat stability service life as expected compliance with the Government Regultions particularly for the food-contact applictions and an acceptable level of performance at the affordable cost is mainly the Compounder's or Formulator's reponsibility. The importance of producing consistent, homogeneous dry blendor pelletized compound to obtain quality end-product on day-to-day basis has to be properly understood for success in PVC processing. Variability in a compound bulk density homogeneity, flow characteristics translate directly to variations in subsequent melt processing, requiring constant readjustment of the processing conditions or higher wastages, if not properly monitered. 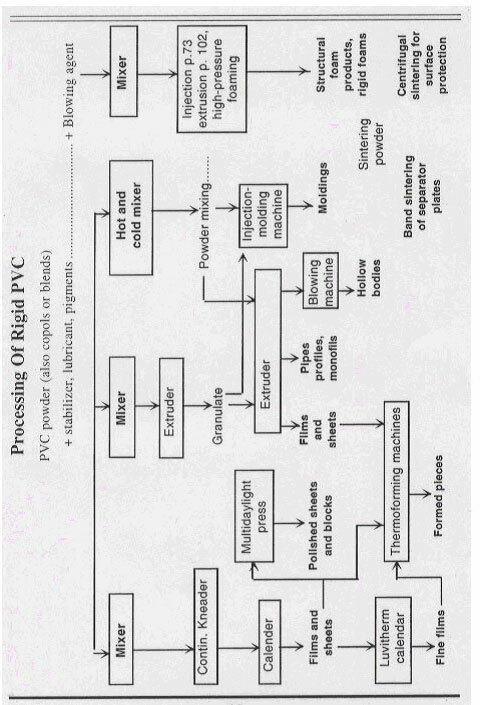 Three types of resins are generally used in the processing of rigid PVC. Bulk PVC resin absorbs plasticizer faster than an equivalent K-Value suspension resin. It is pure with no emulsifier or suspending agent and with lowest wet absorbency among all PVC resins. Products with excellent clarity and sparkle can be manufactured from bulk PVC Resins. Because of use of emulsifiers, this resin is less transparent. It gels less and has antistatic properties. It has an advantage that the products manufactured are free of fish-eyes and flow-lines. Resin Molecular Weight influence the physical properties of the end-product as well as the inherent compound heat stability and processing characteristics, very generally, as shown earlier. A grade generally used is of 50,000 to 70,000 average molecular weight which corresponds to K-Values between 54 and 63. This range is also suitable for injection blow moulding, extrusion blow moulding and calendering. For the manufacture of pipes, profiles, conduits and sheets, PVC Resins in the Mw range of 70,000 and 1,20,000 or K-values between 63 and 75 are preferred since the properties of importance for the end-products are higher modulus of elasticity, heat distortion temperature and impact resistance. PVC Resins as such are very heat sensitive and have to be processed at low temperature and as such, heat stabilization is extremely important. Perform fusion rate with adversely affecting melt viscosity of the compound, the heat distortion temperature or the impact resistance of the end-products. Plasticizers, one of the earlier usage as processing aids, lower apparent melt viscosity, reduce heat distortion temperature and have a detrimental effect on impact strength. Increase melt strength and homogeneity. Reduce plate-out to enable faster production. Reduce surface imperfections like flowlines. Control frictional heat built-up by reducing friction. Promote release of the melt from hot metal surface of the processing equipment. Must be insoluble in the PVC matrix and must have good adhesion between the continuous glassy phase and dispersed rubber phase. For applications like bottles, films, blister packaging requiring clarity, the refractive index should have the same value as that of matrix. It should not adversely affect other properties like low permeability and low order of taste and odour. It must retain the elasticity at low temperature particularly for the outdoor applications in colder climates. It must have good thermal and light stability. They provide distributive blending only ensuring uniform distribution of all particles throughout the mix. These blenders are usually equipped with a drive having ratio of 1 hp to 51 to 10 kgs. of product. These blenders, however, have insufficient radial and axial flow to transfer all the materials into the zone of higher intensity and therefore, their overall efficiency is low. They are not able to produce a good dispersion of small quantities of liquid additives like epoxidized soyabean oil. They also cannot disperse satisfactorily agglomerates of organic substances like the benzophenone, UV absorbed. Another limitation is that at low temperature at which they operate, moisture or other volatiles are not removed. Also, it is very difficult to flush out the system, if carbon blocks and some organic pigments like phthalocyanine blue and green are added and may result in colour contamination problems. Best results are obtained with freshly mixed powders. A bottom mixing impeller assembly rotating at high speed. Impellers produce two patterns of flow, one around the circumference of the fowl (that is centrifugal action) and the other a lifting casacading action from bottom to top. Drives with a ratio of approximately 1 hp to 2 kg of resin, which results, in rapid heating of the resin powder. A vertically mounted stationery blade that acts as a deflector baffle of the powder. Two speed motors to minimize high torque while starting. Densification of the powder (increse in bulk density). Homogenization of powder and additives and the uniform coating of resin particles with additives. Removal of volatiles, mainly moisture. The dry blend properties are very critical for extrusion, more so for the single extrusion. The properties that greatly influence the extrusion are Bulk Density, Molecular weight of the Resin and the Flow Properties of the powder. Dry blend properties can broadly be divided in two categories : The fundamental properties, which are mostly resin realated such as grain shape, grain size, size distribution, nature of grain surface moisture content, coefficient of friction and chemical effects and the associated properties which cover bulk density, packing, grain density, angle of repose, permeability and rate of discharge. These mixers resemble ribbon blenders and can be very versatile with proper modifications. They consist of plough-shaped mixing tools or the bakery ploughs which rotate at a very high sppeed. The ploughs mechanically finalize the materials and achieve homogenity by intersecting trajectories from adjacent ploughs. The high shear mixing is achieved by means of choppers mounted on the walls of the blender. Each chopper consists of 4 blades, two tiers, mounted on the extender motor shaft on the inside of the mixing drum. The impacters consist of a series of pins mounted peripherically and perpendicularly in a moving plate, which rotates inside a pinned stationery cage. These mixing rools supplement the mixing action of ploughs and help to increase the temperature which in turn improves dispersion of the additives. The extrusion of rigid PVC directly from the powder blend is gaining wider acceptance, yet melt compunded materials are also widely used particularly by processors with no compounding facility and conventional moulding machines or extruders. Pelletized PVC certainly has a relatively high and uniform bulk density and can, therefore, be processed much easily even on the conventional processing machines. Melt compounding of rigid PVC formulation is generally done using twin screw extruders where temperature control is better as compared to a single screw extruder because in a multiscrew system, the mechanical energy source contributes around 54% and the thermal energy the rest 46% to the melting of the material. co-rotating, intermeshing, parallel twin screw. This is a further improvement over the Bandury Mixers. In these machines, the first section of each rotor is the feed screw which runs in separate bores. The next section begins at the end of the screw and extends as far as the apex of each rotor. This section, helical in shape is known as the Forward Helix because it pushes the material towards the discharge end of the chamber. The next rotor section starts immediately after the apex. This is also helical in shape but in opposite direction. This part of the rotor forces the material back against the new material coming in therby helping through mixing. In two stage version, back-pressure and degree of mixing are controlled by the extruder screw-speed. In batch type, hot melt compounding process centered on Bandury internal high-intensity fluxing mixers and two-roll-mix mixers, there is a great flexibility and despite the inceasing popularity of continuous equipment, these machines are still in use. One advantage of these compounding lines is that they are less sensitive than any of the compounding lines and as such, resins with a wide range of particle sizes, moisture content, bulk density as well as dry blends, cold or warm, can be successfullyu processed in these compounding lines. Despite the high initial costs, the present trend with medium and large scale processors is to develop their own compound and compounding process built around specialized continuous mixers. This definitely results in Economy and Secrecy of Formulations. The ideal polymer for powder feed stocks would be completely devoid of porosity to give maximum density. There is no ideal combination of particle properties for all precessing machines and applications. What is important is the consistency of properties so that optimum relationship between formulation, output and quality can be established by a processor. The majority of rigid PVC applications is based on homopolymers. Copolymers, inspite of their unique role, are restricted to specific applications. Specialised coating materials such as PVC-PVDC Copolymer and Copolymer with Vinyl acetate and with olefin are the two types commercially in use. A very specific application of Vinyl Acetate Copolymers is the maufacture of gramophone records. Higher acetate copolymers are used in the production of vinyl floor tiles. Medium acetate copolymers are employed in the production of calendered flooring and extruded foil, particularly the clear foil for packaging applications. They are incorporated, either internal type or/and external type for improving the flow and prevent sticking to the metal surfaces. In addition to their influence on melt behaviour, lubricants can have a considerable effect on the gelation of polymer in a dry blend feedstock. The presence of heat stabilizers is very necessary to protect PVC melt from degradtion at temperature encountered during processing. These additives assist the melt processing of PVC formulations but in a different way than the lubricants. They do not reduce the melt viscosity and may sometimes even increase the melt viscosity, but they improve the elastic behaviour of the melt. Also, in processing of rigid PVC, even a small addition considerably reduces the incidence of procesing defects associated with melt rupture, which is very desirable in the production of extruded sheets and profiles and for post-extrusion forming. In calendering of foils, flow marks and edge shredding are much reduced and overall quality improved. In injection moulding, improvement in the quality of finished products is remarkable. In addition to improved melt behaviour, processing aids can produce a faster rate of plastificatin of a polymer in an extruder or internal mixer. Most of these additives have a rubbery nature and their effect on processing depends on the physical form of the additive. The impact modifiers are chosen mainly for their effect on finished products properties but they do have a benefecial effect on processing too, particularly in the case of ABS and MBS systems. Some increase in melt extensibility is also observed. Rigid PVC formulations very rarely have high levels of fillers, as in the case of plasticized PVC because of its adverse effect on the impact properties. Small additions of fine particle fillers can aid in the flow of powder blend feedstocks but higher levels of fillers may complete with the surface for lubricant during the powder mixing. It has been observed that higher levels of Coarie fillers impede gelation. A very small percentage of plastic products are dyed, however some of the materials that are being successfully dyed, are acetates, acetals, acrylics, nylone, poly-carbonate, polyesters etc. --Applications that have been successfully dyed include telephone connectors and cables, plasic coated metal parts etc. Plated plastics can be finished in bright chrome, copper, brass, gold, nickel and nickel finishes. The greatest use of plated plastics has been in replacement of metals suchas die-cast zinc and brass as a result of which they are well accepted in industries like automotive marine, appliance, plumbing and housewares. Flock-Coating in addition to its decorative applications is penetrating in other fields like weaving apparel, upholstery, wall coverings, droperies, curtains, luggage, greeting cards, bed spreads etc. Functional applications include mar-proofing sound attenuation, glare-reduction. The basic flock coating system is continuous wetline, incorporating let-off, knife over roll coater, flock machine, vacuum blanket, curing oven, cooling station, vacuum brush and rewind. Fibre for flocking includes materials like acrylic, nylon, olefin, polyester, polypropylene etc. This is the widely used process of decoration, particularly in field of cosmetics. The film of polestar or cellulose acetate called the carrier is coated on one side with a release agent which melts with the applications of heat to the carrier. The carrier film is held over the surface by a heat transfer in a heat brass die, the coating is transferred to the plastic surface. Bright imitation gold accounts for 50% of this application, other finishes possible are woodgrains pearlescent, fluorescent, multicolour designs including full colour and half tones and the latest is chromium leaf on tail lenses, rear deck pannels, front grilles, automobiles etc. Preprinted decorative foils of material like G.P. and H.I. Polystyrene. Polycarbonate and polypropylene are used for this application. In case of thermosets like melamine, a printed melamine impregnated paper is introduced into the moulding cycle after a part of partially cured by interrupting the cycle for placing foil in the mould. The technique is used for all the decorative sheets, melamine crockery handles of appliances housewares, etc. There are different methods which are available for printing. Letterpress, Letterflex Flexography Dry Offset, Offset Lithography, Gravure, Stencil Screening and many more hybrid methods with combination. A particular method is governed by volume, product mix, machine availability and shape of product. Product of polyolefins needs a pretreatment for improving the adhesion of the printing ink. This is employed for finding bright meallic finish to a plastic product. A product is given a base coat to prepare a receptive surface and is placed in a vacuum chamber where aluminium is deposited on it by means of vapourising of the aluminium by application of electric current. Coated surface further coated with a protective transparent lacquer to protect the coating during handling. Cast film, thermoforming film and sheet are manufactured continuously on extrusion lines with short dies. Depending on thickness and the subsequent conversion process, the plastic product is wound in web form or stacked in fixed lengths; the products are known as cast film, thermoforming film or sheet. The final product is generally the decisive factor as regards the extrusion line concept. Laminating film, single or multilayer film, depending on requiement also with barrier properties. Polished and reeled thermoforming film are manufactured in thickness of 0.2 to 0.5 mm. Thermoforming film (single or multi-layer), made from HIPS, GPPS, ABS, PP, HDPE, PC and PET, is formed on automatic thermoforming machines into packaging for fat-based products and dairy products as well as food trays, etc. (e.g., margarine tubs and yoghurt cups). Sheet is extruded in thicknesses of 0.8 to 30.0 mm and stacked in fixed lengths. Sheets made from HIPS, GPPS, ABS, PMMA, PC, SAN, HDPE, PA, PP, LDPE and PVC or their composites, have a very wide range of applications; they are processed into refrigerator housings and inner parts, suitcases, protective coverings, industrial containers, constructional elements, wall coverings, lamp shades, sanitary products, safety glases, etc. With regard to their economic importance, products manufactured from thermoplastics on extrusion lines of this type occupy third place after blown films and pipes. A high percentage of these plastic products is used for packaging and food packaging, accounting for the lartest share. New packaging guidelines, environmental protection demands and energy costs, as well as the economic utilisation of raw materials have in recent years, provided the strongest incentives for the improvement of these extrusion lines. The machinery manufacturers have had to face these challenges in the past and must continue to do so in the future. Cast film is manufactured on chill roll extrusion lines by the cast film extursion process. The homogeneously molten polymer melt is formed by the slot die into a molten film, which is cooled on the casting roll. An accurate, constant temperature control of the whole cooling system and a good film web guide are of very great importance for cast film. Before it reaches the wind-up unit, the film is edge-trimmed and, where necessary, divided into reel widths. Nowadays, winders operate fully automatically, control film tension and achieve good winding qualities with pre-selectable winding characteristics. The performance of a cast film extrusion line is largely determined by the following factors: extruder throughput; casting roll diameter and, where necessary, subsequent cooling rolls; film thickness; speed of extrusion line and winder; process technology and raw materials. Cast film extrusion lines are manufactured in graduated widths of 900 to 3,500 mm. Edpending on products and throughput, speeds of upto 350 m/min are achieved. Off-line production : Here, the thermoforming of the plastics web takes place in a separate operation. The advantage of this system is that the films can be wound onto large-sized rolls or manufactured in multi-reel form, thus ensuring better utilisation of the plant capacity. This additionally gives greater flexibility when processing raw materials, which change frequently. In-line production: In this system, residual heat in the film web is utilised and the final product thermoformed line, in the same operation. The advantage of this stsdtem lies in better energy utilisation. Such plants are suitable for large-scale production; the web scrap is immediately recycled into the extrusion process. The plant widths of 900, 1,200 and 1,600 mm are adapted to the working widths of the thermoforming machines. The design of the plants for the manufacture of sheets is determined by the product and the subsequent fabrication method used. The polishing stack has to meet especially high requirements, particulary when transparent sheets are being manufactured, e.g., PMMA, PC, PS, etc. The prerequisite for good sheet quality is the design of the polishing stack. The dwell time of the molten web on the rolls, and hence the quality of the sheets can be influenced by variations in the roll configurations and roll dimaeters. A sheet extrusion line of modern construction consists of the following units: extrusion, forming, cooling and sizing, pull rolls, cutting, stacking, regulation, measurement and control. Sheet extrusion lines are sipplied in standardised roll widths of 800 to 3,500 mm. Slot dies: Here, mention must be made of an interesting new development: automatic adjustment of flexible lips by means of translator bolts, when extruding thin film. The translators are assembled in sandwich construction from ceramic discs and permit a direct, no-loss conversion of electrical into mechanical energy, whereby a direct geometric, charge-controlled change in length occurs at great force and without any time lag. By means of a specially developed electronic system, the change in length of the translators to the desried working length takes place in milliseconds. These piezoelectric translators are actuated by means of a high-voltage generator in conjunction with a thickness gauge and control electronics specially provided for this purpose. The die lip controlled by translators in conjunction with thickness gauge and control computer are the most important part of an automated extrusion line. Existing extrusion lines, can, without difficulty, be retrofitted with this enclosed unit consisting of extrusion ide with translators and control computer. Coextrusion dies : In the manufacture of cast film, thermoforming films and sheet, co-extrusion is acquiring an increasingly important position. Hence, the majority of all newly installed extrusion lines in the field are designed for production of multi-layer films. This inevitably led to interesting new developments and improvements in coextrusion dies. This applies to multiple-manifold dies, adapter systems and their combinations. Mention can be made here of a particularly interesting innovation - a feed block with interchangeable cassette. The melt streams, plasticised in several extruders, are passed through a manifold block before being brought together in the adapter to form a composite. This feed block is equipped with a cassette to enable the layer arrangement in the composite to be changed. With this quick chanage operation, it is no longer necessary to detach connections or shift extruders. automation with regard to the use of CIM. accurate parameter control (e.g., web tension, contact pressure, reel width). The demand for film with improved properties, e.g., by monoxial stretching, has lately increased. An in-line stretching machine has thus been devloped. With this new gap stretching machine it is possible to obtain orientation of the molecule chains in longitudinal direction. The properties of single and multi-layer films made from the commonly used thermoplastics such as polyolefins (PE and PPI, PA, PS, HIPS, PET etc., can thus be altered. Monoaxial orientation enables performance properties to be achieved, such as an increase in tensile and tear strength in the monoaxial direction, improvment in transparency and film stiffness, obtaining a splitting tendency, influencing film elongation and shrinkage values, both in the monoaxial and biaxial directions. The system employed in the gap stretching machine, permits one or two specifically defined stretching points in the gaps between the pairs of rolls especially designed for the purpose. The stretching gap is adjustable in the micro range and thus permits specific stretching to be carried out irrespective of the raw material. This results in an optimum degree of orientation of the film since stretching takes places via the shortest route with only slight necking of the film web. This gap stretching machine is constructed in width of 1,200, 1,600 and 1,800 mm. It can be used for in-line and off-line production, i.e., from reel to reel. Cast film extrusion lines should be constructed on the modular principle and permit the integration or rapid adding-on of an embossing unit for production of smooth or embossed film. Films manufactured using the embossing unit are mainly converted into articles for the hygiene, baby diaper and sanitary goods sector. Thermoforming film lines : Thermoforming films are mainly produced on extrusion lines especially developed for the purpose. 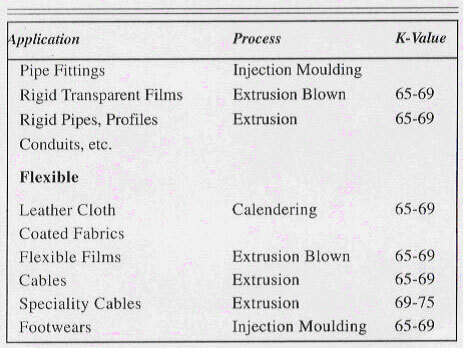 On the basis of existing polishing stocks, suitable roll configurations were developed specifically for thermoforming films. Thin film made from PET/PP etc. in a thickness of 0.1 to 0.4 mm is manufactured by the chill roll casting process, films from 0.2 mm thickness upwards by the polishing method. Because of the high nip pressures which arise, a polishing stack is best suited as a basic machine. separate nip adjustment, roll locking system, roll drive, ease of operation, reliability in operation. The requirements in respect of the longitudinal and transverse cutting of sheets are increasing all the time. Main importance attaches to dimensional accuracy, rectangularity as well as quality of the cut surface and freedom from flash. In order to meet these requirements, especially in the case of thick sheets, a new cutting-milling device was developed. It is well known that at high cutting speeds, the low heat conductivity of plastics leads to problem both with the cutting device and the product. At sheet thicknesses from 10 mm to 30 mm, the new longitudinal cutting-milling device operates at a slower, controllable cutting speed of below 600 rpm. The installation of a hydraulic retaining system at the swivel arm of the saw motor contributes to the stabilisation of the sawing operation and hence to the cutting quality. Optimum results can only be achieved, however, by carrying out cutting trials at different cutting speeds and with variations in the shape and number of the teeth. Economic production of film and sheet would now be inconceivable without the re-use of scrap. When extrudate is manufactured from a single raw material, the scrap is ground and by means of well-known systems directly recycled to the production process. Scrap from multi-layer composites consisting, for example, of PP/tie layer/PVDC can only be recycled to the production process if this melt is integrated in the composite as a separate layer. For this purpose, a new die was developed, comprising a combination of multiple manifold die and adapter system. Automation is no longer merely a slogan; automation concepts are state-of-the-art in extrusion lines. However, the degree of automation should always be in the right proportion to the benefits derived. Within the automation system, the central console together with the processor performs functions such as open and closed loop control and computing. The following degree of automation can be attained in a coupled control circuit with the aid of previously entered parameters and presented on the colour monitor in the form of diagrams or reports, or in some cases printed out: product data, process data (pressure, temperature), formulations, mixing ratios in metering units, thickness profile (tolerance, trends), flow controls in the extruder (especially important in the case of coextrusion with several extruders), wind-up parameters, positioning of the cutting units, warning signals, etc. The modular design of this systems enables the degree of automation of be extended at any time. Operation of automated plants of this type requires no programming skills whatsoever and is amazingly simple. The continuous automatic supervision of all functions of the line ensures uniform product quality and optimum raw material utilisation at reduced labour. This mature automation system can be connected upto an existing central computer or a BDE system by means of coupling cards. recycling as a means of achieving economic utilisation of plastics scrap. Particluar attention must be attached to the public debate on the environment. Products which in some case, have been in use for many years, are now being questioned and new products called for.